Illustration of a synapse (from the book Why Materialism Is Baloney). I think one can get a visceral, intuitive sense of how, what is often referred to as "the hard problem of consciousness," actually is "the impossible problem of consciousness," through a simple, thought experiment. Note that in this piece I am going to be using the following words interchangeably: mind, consciousness and you. But first a reminder that "the hard problem" refers to the question of how the physical processes of your brain create consciousness: your self-awareness, the flow of your thoughts, feelings, and experiences, the totality of your subjective experience, i.e. YOU. This problem is considered by many to be not just a hard problem but the hard problem confronting science, because of the disconcerting but simple fact that there is nothing about the physical activity of the constituent particles of your brain, at any level of organization you choose to examine them, cellular, molecular, subatomic, etc., from which the qualities of subjective experience can be directly derived. Not only is there nothing remotely like a flowchart in some neuroscience textbook, displaying a sequence of discrete, material steps or processes, describing a smooth transition from physical processes to you; "The hard problem" is one of the very few problems in science, for which there is not even, the beginnings, of an inkling, of a clue, of what a progression of causality from meat to self-awareness might look like. Forget theories, forget hypotheses, after over one hundred years of research, attempts to think about and then elucidate explanatory ideas about this progression of causality amount to vague notions that often reveal more about the limitations of language than "the hard problem" itself. Think about this for a moment. For many phenomena in nature, scientists can with some confidence project that it is only a matter of time before they can reductively chip away at understanding how one physical process leads to the next, which in turn leads to better ideas about what the next sequence of physical processes will be, et cetera, right along the chain of causation until they get to the thing they are trying to understand. Most things science has described have a fairly clear, contextual place in the map of reality that has so far been worked out, all linked together in a vast network of things and causation. It is not an exaggeration to say that, consciousness exists outside this map. Roads that seem to lead there come to an abrupt cliff far from the final destination. So Where Do Scientists Think Consciousness Comes From? Here are brief descriptions of the three predominant working ideas, (at least among the dominant group of materialist scientists who believe that mind arises from and is completely contained in your physical brain), about where you come from. The first is that you don’t really exist. In this view, you may think you are aware of yourself reading this as you, but you are not really, it’s just an illusion. Consciousness is an illusion. A major proponent of this view is philosopher Daniel Dennett. The second is that brain activity is consciousness. This is often summarized with phrase "Mind is what brain does." What does this mean exactly? Well proponents don't seem to know either. Here is Dr. Susan Blackmore from her recent post Correlation is not a cause (undated) on Edge.org. At the moment we have no inkling of how consciousness could be brain activity but my guess is that it will turn out that way. Once we clear away some of our delusions about the nature of our own minds, we may finally see why there is no deep mystery and our conscious experiences simply are what is going on inside our brains. A property of a system is said to be emergent if it is in some sense more than the "sum" of the properties of the system's parts. An emergent property is said to be dependent on some more basic properties (and their relationships and configuration), so that it can have no separate existence. Unfortunately while every other emergent property known in nature, can be deduced directly as a consequence of the physical processes from which it emerges, with consciousness that is not the case. There is the physical activity of the brain, and then there is you, and in between there is a bottomless conceptual and evidential chasm. Why do these three main ideas inform neuroscience, because they are the only possible choices allowed for a priori within the materialist paradigm, where nothing by definition, can exist outside the matter and energy fields that comprise the totality of reality, including mind. Current neuroscience research is hobbled by this dogma that the brain must produce mind regardless of any evidence to the contrary. Think about these three ideas after you go through the thought experiment. Ok, we are just about to dive into our thought experiment, but first I suggest you read this short explanation of how our brains actually work. Trust me it will make the thought experiment that much more illuminating. This passage is excerpted from Why Materialism is Baloney by Bernardo Kastrup, which presents an excellent counter-narrative to both Materialism and Theism that I highly recommend if you wish to explore this topic further. Before continuing our discussion we need a little more background on how the brain works. Although neuroscience is a complex discipline, its fundamentals are surprisingly simple. After you read the following few paragraphs you will have a fairly good overview of what happens inside your head. It’s simpler than you might suppose and anybody can understand it with little effort, irrespective of background. Moreover, these simple fundamentals will be more than sufficient for you to understand the rest of this chapter. All I ask of you is focused attention for the remainder of this short section. Here we go. The brain is composed of two main types of cells: neurons and glial cells. Neurons do the actual work of processing information, while glial cells perform support functions like insulation, structural and metabolic support, etc. For the purposes of this book, we can ignore the glial cells and focus solely on neurons. Each neuron is composed of three main parts: the neuron’s body, the dendrites and the axon. See Figure 1. The neuron’s body is the main part of the cell, responsible for coordinating all of the neuron's activities. The dendrites are extensions of the neuron's body that contain many branches. The axon is a long, thin, cable-like projection that extends far from the neuron's body so to connect it to other neurons. The tip of the axon typically branches out into several terminals. The brain is basically a giant network of interconnected neurons. Roughly speaking, the axon of a given neuron connects, through its multiple branching terminals, to dendrites of many other neurons. See Figure 1 again. 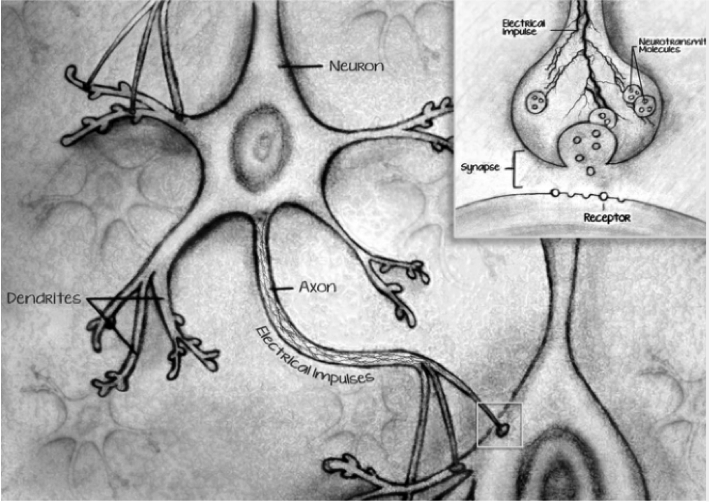 The point where an axon terminal meets a dendrite is called a synapse. The terminal and the dendrite don’t actually touch: a tiny gap remains in between them, which is called a synaptic cleft. Here is how the whole thing operates: the body of a neuron generates an electric charge. The axon of the neuron carries this electric charge all the way to its terminals. If and when the electric charge grows strong enough to cross a certain threshold, it triggers the release of certain chemicals at the terminals, which are called neurotransmitters. When this happens, the neuron is said to have fired. The neurotransmitters released then drift across the synaptic cleft and stimulate the dendrites of the neuron on the other side of the cleft by fitting into chemical receptors. This is also illustrated in Figure 1. The corresponding stimulus can be an excitatory one – causing the other neuron to increase its own electric charge – or an inhibitory one – causing the other neuron to reduce its electric charge – depending on the neurotransmitter released. Whether a given neuron fires or not – that is, whether it releases neurotransmitters or not – is thus determined by how many other neurons connected to its dendrites are firing or not, and by what type of neurotransmitters – inhibitory or excitatory – they release when they do fire. A neuron only fires when it has been stimulated with enough excitatory neurotransmitters released by other neurons and provided that it has not been too inhibited by inhibitory neurotransmitters. The entire process has electric aspects – namely, the buildup of electric charge – and chemical aspects – namely, the release of neurotransmitters. We thus say that the brain operates on the basis of electrochemical processes. A neural network is basically a set of neurons connected together, through synapses, according to some network topology. There can be huge chains of interconnected neurons in the brain: neurons connected to other neurons, which in turn are connected to other neurons, and so on. These networks can also contain closed cycles, whereby a neuron at the end of a chain connects back to a neuron at the beginning of the chain. The brain can be seen as a superset of many neural networks. Brain activity is associated with the firings of neurons in a neural network. Though there are many neurons in a network, typically only a subset of them is actually firing when observed. Neuroscientists can scan a living brain and see which subset of a neural network is actually active. We call each one of these active subsets a neural process. As we will see below, conscious experience correlates with certain neural processes in the brain, which are then called the neural correlates of consciousness. Naturally, neural processes can be excitatory or inhibitory, depending on whether the neurotransmitters they release respectively increase or decrease the electric charge of connected neurons. That’s it. Not too difficult, was it?" Bernardo Kastrup, "Why Materialism Is Baloney: How true skeptics know there is no death and fathom answers to life, the universe and everything" (Winchester, UK: Iff Books, 2014) 27 - 30. That’s all the prep we need. Let me just add that the current estimate for the number of neurons in a human brain is roughly one hundred billion. She is connecting many incoming electronic signals (phone calls) by physically connecting wires that run between telephones or sub-stations, in a fashion not too remotely dissimilar from the neurons in your head. Of course neurons can’t think, so if she confuses you, replace the human operator with the racks of mechanical relays that performed the same function starting in the 1950s. 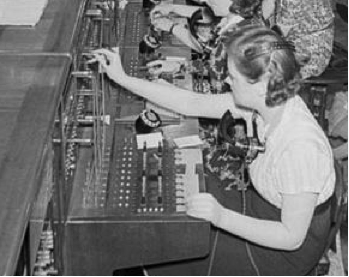 Now imagine those phone calls coming in and our operator spending her day plugging and unplugging wires or if you prefer, a relay clicking open or closed as it makes or breaks an electro-mechanical connection between two wires in the international network of the telephone system. The result of each unit of activity, is pretty straightforward right? There is simply the making or an unmaking of an electrical connection, eventually resulting in a mundane and expected physical activity; a phone call being completed or disconnected. Now pan back and visualize two relays, then four, then a whole room full of them. There are still just a bunch of simple mechanical actions going on, electrical connections being made, and phone calls being completed. Now try to imagine racks and racks of telephone relays as far as the eye can see, all doing their electro-mechanical thing. Imagine yourself rising into the air until you see relays receding to the horizon in all directions. Imagine you are looking down at one hundred billion of them. Try to imagine all that electro-mechanical switching. Wow what a racket! So, what would you expect the outcome of all that activity to be? A whole lot of phone calls that’s for sure. How about this, how about YOU! There you are in all your self-aware and not so self-aware glory. You have emerged from all this electro-mechanical activity. Maybe at this very moment you are feeling a complex rush of excited emotions because someone you have recently fallen in love with has unexpectedly entered the room. Can you envision how the qualities of that experience, your awareness of them, your very self, might come from the activity of all those relays? No? Now replace the relays with neurons as described above, making electro-chemical rather than electro-mechanical connections. Can you envision a giant network of them going off in all directions, as far as the eye can see? Now ask yourself the same question, one or one hundred billion, can you envision yourself somehow being the bonus result of all those squirting chemicals and electrical signals being passed around? Does the question even make any sense to you? What could possibly be happening as we add neurons, so that somewhere between one and one hundred billion, full blown, self-aware, human consciousness, spontaneously emerges, even though there is no change in what each neuron physically does either alone or in-network? That is the "hard problem of consciousness." That is the impossible gap that materialist scientists and philosophers must fill, in order to explain how your brain and you can be the same thing. I urge you to remember this the next time you read about the latest experiment purporting to show how scientists are "unraveling the mystery of consciousness" or other such public relations hyperbole. You are probably thinking that this exercise is some kind of trick, that I have purposely left something out, or exaggerated or underplayed some critical element of brain operation or crucial detail of what the various materialist positions are. Copyright © 2014 by Robert H. Clark. Published with permission. Excellent. Now please explain how real self consciousness works and interacts with the physical brain and nervous system prior to, during, and after physical existence. I think people really want to understand this process. Thank you. Nice variation on philosopher Ned Block's"Chinese nation" thought experiment and Leibnitz's "mill that could think" both of which cogently argue that subjective mental states (qualia) cannot successfully be explained by reference to functional states. But, like you say, such is the orthodox commitment to materialism we seem destined to go round in ontological/epistemological circles for some time yet! You know Andy I think we are very near the end of the historical period which has been dominated by the materialist paradigm. You can even date it to roughly 1960 when the era of modern resuscitation medicine begins. The field is really taking off now, especially with the advent of recent techniques involving lowering body temperature. As the number of people brought back from death, and I mean stone, no doubt about it, dead as a door nail, dead, greatly increases, so will medical accounts of NDEs in general, but also those with strong veridical elements. There are going to be thousands to tens of thousands of these a year. The sheer number of them is going to push the issue of Survival to the center stage of global culture and force science and philosophy to confront the inadequacy of materialism as a worldview. At least this how I'm betting. Thanks to Rick Stuart, Don Salmon and Peter Jones, fellow regulars on Bernardo's forum, for being nice enough to read and comment on earlier drafts. Apologies for any advice not taken. And of course heartfelt thanks to Bernardo for being generous enough to publish it. Excellent essay, Bob. I was particularly amused by the minimalist way you dismissed Daniel Dennett. Thanks Ben! Bernardo's quip in WMIB sums up the incoherence of the position beautifully. "If consciousness is an illusion, then who is having the illusion?". I think that's pretty close, don't have a copy handy to check. Most people, I think, tend to assume from their experience of life that there are two parts to themselves, the physical and the mental, matter and consciousness. This assumption leads to a slightly different hard question, 'How do two such seemingly different things as consciousness and matter interact and communicate with each other?'. The difficulty of this question can be so great that it can lead to the denial of either one of the two phenomena we initially assume to be self evident: the materialist may deny consciousness exists outside of matter, and the idealist may deny that matter exists outside of consciousness. Which of these two approaches you choose to follow depends on which of the two phenomena, matter and consciousness, you feel is the most important, the most self-evident, the most fundamental, the most irreducible, the most significant and the most difficult to treat as a merely secondary, derived phenomena of the other. This choice is probably decided by personality type and personal experience. The scientist or engineer who works daily with physical calculations and creates things that work and are experienced as solid and external, may find it more difficult to let go of matter as a separate and primary phenomena. The philosopher or therapist who works with ideas or emotions may find it more difficult to accept conscious as not being primary and as being reducible to matter. It perhaps simply comes down to which phenomena we personally value most and fell most comfortable with and feel is therefore more important and gives us more security: physical external things or internal ideas and emotions. Both the materialist and the idealist then need to explain how their primary phenomena generates the secondary one. For materialists this leaves them with the hard question of consciousness emerging from matter. For idealists this question becomes, how does the experience of matter, of non-consciousness arise from consciousness. The latter can be answered in two ways, firstly by panpsychism - everything is conscious, or secondly by saying that consciousness can create an aspect of itself that is, in itself, not conscious. Panpsychism, to be any more successful than materialistic 'consciousness is an illusion' theories, needs to explain exactly how things that show no signs of consciousness are actually consciousness, that is they need to explain how our experience of non-conscious things is in some way an illusion. Similarly, Idealism, to be any more successful than materialistic emergence theories, needs to explain exactly how consciousness can create something that is not conscious. How exactly do non-conscious things emerge from consciousness? We can use analogy and refer to a dream as an experience that feels like it is populated with non-conscious things but then we wake up and realise it was all a creation of my imagination. But that still leaves the question of how that happens, whether in a dream or anywhere else. How can consciousness imagine something that is not conscious? If consciousness is all that there is, how can it create something that is not conscious? Is it enough to say that this is simply what consciousness does: it imagines and creates images and things that it can experience as being separate from itself? Is this any better that the materialist saying that consciousness is just what brain activity is? For me this remains a hard question of Idealism, the hard question of non-consciousness. Stephen thanks for the interesting comment. Bernardo addresses "the hard question of non-consciousness" here. To me the whole thing seems like a non-issue, the solid objects in your dreams are clearly in consciousness but not conscience. oops auto-correct "..but not conscious.."
I think the difficulty you see in the question "How can consciousness imagine something that is not conscious?" arises from an epistemic confusion. For consciousness to imagine things that are unconscious is default and poses no problems whatsoever. Being conscious almost always implies being conscious of something. That something is an 'object' of consciousness or, more accurately, an excitation of consciousness. There is absolutely no need, neither theoretical nor logical nor aesthetical, for an excitation of consciousness to be itself conscious. Why should it be? Why should the characters in the dream of a conscious entity be themselves conscious -- i.e. why should there be something it is like to be those characters? The challenge, in fact, is the opposite: how can an excitation of consciousness correlate to an entity that is itself conscious? Why should there be something it is like to be me, while I am clearly an excitation of your consciousness? That's the challenge an idealist has to face. The challenge you posed implicitly assumes the necessity of panpsychism, which I entirely deny. You wrote: "Is it enough to say that this is simply what consciousness does: it imagines and creates images and things that it can experience as being separate from itself?" You answered it yourself: "We can use analogy and refer to a dream as an experience that feels like it is populated with non-conscious things but then we wake up and realise it was all a creation of my imagination." Yes. But then you continue: "But that still leaves the question of how that happens, whether in a dream or anywhere else." How it happens are the patterns and regularities of the flow of consciousness. We know some of those now: we call them the laws of nature. We also know some of the archetypes of mind, which are entirely of the same nature. Knowing the "how?" of your question is the same as understanding those patterns and regularities. Idealism poses no further burdens on this than materialism. Stephen, let me insist on one point: we should not confuse being in consciousness with being conscious. Consciousness can only create 'things' in itself, since it can only experience its own excitations. As such, inanimate matter is not independent of consciousness, but a manifestation of consciousness. It is images in mind. But the images do not need to be themselves conscious for idealism to work, even though some admittedly are. Stephen - I would agree that the problem is same for both materialism and idealism, if these are simply mirror images of each other. But there is always the option of denying both the views. Then we can say that mind does not create matter or vice versa. Many philosophers who tend towards idealism end up with a third term in their theories, (usually God), as a consequence of the impossibility of explaining mind and matter in terms only of each other. Bear in mind that Tao, Brahman, Nirvana, the Authentic, the Real etc,, would not be merely another mental or corporeal phenomenon. Idealism does NOT state that mind creates matter as a substance outside mind. That is a form of dualism where mind is the creative power (a popular New Age view). what Idealism says is that matter is a particular modality of experience and, as such, exists only in mind. Matter is a particular time of images imagined in the "space" of consciousness. The whole thrust of my work is to deny the impossibility of explaining matter in terms of mind, if I define "mind" as the "space" of subjective experience. That entire body of work is my argument against what you just said. But please notice that I use the word "mind" as a synonym of consciousness, not as "thought." In Neo Advaita circles, "mind" is taken to mean "thought", which is not the philosophical meaning of the word "mind. Peter, may I be so bold as to suggest you might be missing some of the subtleties of my position, perhaps because of the "Idealism" label I chose. In my favorite analogy, consciousness = water, experience = movement of water. Yet, water still exists when it's not in movement... Moreover, the perceived (i.e. water in movement) and the perceiver (i.e. water) aren't different. Pardon me Bernardo. I hope I'm not getting caught up in labels, but they can be confusing. I don't think I'm misunderstanding you but maybe so. I know whet you're saying about matter, no problem there, but I'm digging right to bottom of your theory. I'm uncertain of what you're proposing in one major respect. May I ask, in your idealism, how would you reduce mind? Or do you reduce it? I think Bernardo doesn't reduce mind because mind in the way he uses it is synonymous with the one consciousness that is his ontological primitive, his primary irreducible assumption. If by mind you mean my mind and your mind, our thoughts and mental subjective experience, then I think Bernardo reduces that to mind/consciousness by saying it is a localised area of mind/consciousness. Stephen. Excellent question however you actually answered your own question. When you dream do you the dreamer create inanimate or unconscious things in your dream? Is the you in your dream unconscious? There is no duality in dreaming. How does the One create matter? What really is matter? Matter is just electromagnetic wave-particles brought into our reality here through conscious perception (double slit experiment). Even the nuclei of atoms are now know to be subatomic and therefore ultimately wave potentials. There really is no "there", there. So let's finally let go of this "matter" delusion. Matter is created by the One in the same way you do when you dream. Everything in the dream is of the dreamer. There is no thing including the you in your dream that is not of you the dreamer. Is every thing in your dream conscious? Probably not but it is still of consciousness of the dreamer. This is the way it is in the greater reality. Every thing here in this universe is of the consciousness of the larger consciousness system. It could be no other way. We call this the One. There has always been and will always be just One consciousness. We and everything of it are It experiencing Itself. From time to time we localize as Bernardo puts it as self aware whirlpools in the stream of consciousness. Then we return to the stream. Are we self aware after "unwinding" and returning to the stream. As one that has had OOBEs in the stream I remained self aware but also part of the larger stream. Does this persist or dissapear at some point? I don't know. However, it doesn't really matter if the egoic self persists or is only a tool of the larger consciousness system for here. We are of the One consciousness. No thing can change that for It is all that really is. Every thing else is an illusion. If you want to understand reality you simply need to understand your dreams. You are both the you in your dream and the you the dreamer of your dream. There is no duality. There is just the One dreamer. Row, row, row your boat baby. Relax and enjoy the ride. John and Rick (and indirectly, Bernardo:), great answer to Stephen. I'm really interested to see his response to this. This seems so intuitively self evident, I always find it baffling that people don't immediate respond by saying, 'Oh, I see." I don't think it's a matter of reason and logic. There's a way of attending to our experience that results in materialism. Change that, and materialism will be gone. You won't even need complex rational arguments or empirical evidence. The empirical evidence is right in front of our noses. 1. What we know in our direct experience is the appearance of forms (including all we call "matter" as well as thoughts, feelings and sensations) in awareness. 2. As long as we do not allow "knowledge by identity" (what is called "Prajna" in Zen) as a way of knowing, we have to make an inference as to what exists (and how it exists) outside our individualized awareness. The assumption which is most parsimonious is that whatever exists also has the "structure" (bad word, sorry) of "forms in awareness." 3. Thus, no need to assume "forms" exist outside the matrix of awareness. Thus, no need for physicalism, or materialism, or physicalist naturalism. Done! Don't need a book or even an article. It's clear in just 3 points. Though, Greg Goode has written a book which elaborates on this: "Standing as Awareness". And better than that, (and briefer) is the appendix to Krishna Prem's commentary on the Gita (Appendix A - it's available here on the forum). He does it in 3 pages. Much better (infinitely better!) than I just did. For me, materialism was over in 1975 when I read it. I'm still amazed when people read it and don't immediately get it. It's not hard at all, so it can only be due to emotional attachment and the left hemisphere mode of attending, which cuts out the pieces which we wrongly assume to have independent existence (independent of awareness). Ulrich Mohrhoff calls it "the cookie cutter paradigm" - the left mode way of attending to experience. So, no hard problem of consciousness, no hard problem of matter (unless you're a materialist - then you have to deal with the impossible problem of mind-indepedent matter. When you get it - which should only take a few minutes - the problem is over! Can you give a URL to the appendix, please? The two terms, consciousness and form, are in constant use throughout this book and an understanding of the sense in which they are used is of vital importance. If any experience is analyzed – say, for example, the visual experience of a blue disc – two aspects can be distinguished. There is the content, a round blue shape in this instance, and the 'awareness' of that shape. The content is what I have termed form and the awareness consciousness. It must be carefully noted that 'form' does not here mean outline, but filled-in content-shape, and the term must also be understood in the same way of other elements of experience, sensuous or non-sensuous. For instance we have the 'form' of a sound, a taste, a feeling, or a thought, which must be understood by analogy with the forms of visual experience. In contrast with these forms, which are all different both as regards individual forms within one class and as regards different classes of forms, there is the awareness or consciousness, which is of the same sort throughout. There are many drawbacks to the use of the word 'consciousness.' In the first place it is used in half a dozen different senses by philosophers and psychologists, and in the second place it suffers from the great drawback that it has no active verbal form. One can say 'to be conscious of' but not 'to conscious' such-and-such an object. There is the word 'awareness' and the dubious coined derivative 'awaring,' which I have also occasionally pressed into service, but it is ugly and not very current. The best term is one that was coined by E. D. Fawcett in his The World as Imagination, Zermatt Dialogues, etc. The term in question is consciring – i.e. “knowing together” - and has as its correlative, for the content-form, the word conscitum (plural, conscita. I should certainly have availed myself of these coinages but, unfortunately, they are not as yet sufficiently widely current to be generally understood and, moreover, a great deal of the book had been written before I came across Fawcett's writings. part 2 It should be clear from introspective meditation that all forms are sustained in consciousness, and that, apart from consciousness, we know nothing and can know nothing of forms. It is in fact meaningless to talk of forms as existing apart from consciousness [he adds this footnote: “This position must by no means be confused with that of subjective idealism. The consciousness spoken of is not 'your' or 'my' consciousenss, in fact 'you' and 'I' exist only as constellated form-sequences brought to foci in that consciousness which, in itself, is neither human nor individualized, but a pervading Light.”] The ojbecfts supposed by some to exist behind the forms are mere mental constructs devised fror dealing with experience in practice. No one knows them, no one can ever know them; to believe in their existence is a pure and quite uncalled-for act of faith. It should not be supposed that by the forms are meant sensations, camera pictures of reality located somewhere in the brain. The brain itself (as an 'object') is one of the constructs of which mention has just been made. The usefulness of such constructs in certain realms of thought and study is not at all denied, but they are irrelevant here. The primary bedrock of experience is not sensations in the eye, ear, or brain, but visual and other forms in space. All the rest is inference and construction. Materialistic science begins by abstracting consciousness from the forms in order to deal with them more objectively and impersonally and then, when analysis fails to reveal any life or conscious principle in those forms, triumphantly exclaims that all is mechanism, nowhere is there anything of a spiritual nature. Behaviorist psychology is an example of the same procedure applied to mental life. If you start by abstracting consciousness from phenomena it is obviously absurd to expect to find it as a term in your concluded analysis. For this reason no one should feel disappointed that science (as nowadays practised) does not know anything of the existence of the 'soul.' It is the old story of looking for one's spectacles when they are on one's nose. To go into this subject fully would require a volume and not an appendix. Here I am only concerned to indicate the sense in which the word 'consciousness' has been used in this book. It follows from that sense that the modern term 'unconscious' mind can have no meaning. There is not the slightest reason for supposing that anything whatever, physical or mental, exists or can exist save as the content of consciousness. Hence we can talk of a sub- or a super-conscious mind, meaning by those terms mental processes that are sustained in consciousness below or above the level at which it is normally focused, processes which are not attended to by normal consciousness, but we cannot talk of an unconscious mind, for that would have no meaning. by the way - just to underscore how profound these few words are, take just the sentence noting that consciousness has no active transitive form. At first glance it may seem like a minor grammatical quibble. If you reflect on it a bit, you'll find it overturns almost everything the New Age, neo-Vedanta non dualist gurus are saying about free will. It shows a way to a completely different understanding of volition, one rooted in the Divine Creative power of Shakti. (sorry Bernardo, I know you don't like these things which seem so far beyond our present day science, but i think there's a value in pointing to such experiential observations). That appendix and comments on the use of terms such as 'consciousness' / 'awaring' is interesting. Elsewhere I've have read the formulation of "awareness taking the shape of..." to get around this, which I found helpful. It evokes the image of a vast space which is made of a material which takes on the form of content - like the water/whirlpool analogy. Free will then corresponds to "changing one's shape" rather than there being a doer/done split, in the same way as one doesn't "move one's body' rather "the body moves" or "you move". Let's take the thought experiment one step further. Assume the network could produce "you". Now what happens if another network exactly like it were created. It would have to produce "you" as well! How could it not? Now imagine 7 billion such networks. This is another major flaw in materialism. There is no explanation of how material can produce consciousness or how it could produce "individuals" as well. Hi tjssailor. I have been thinking about this ever since you posted. I don't think it holds. I think once you take the position that mind emerges or simply is the brain, then variation would just naturally arise from accumulated experience and physical differences among brains which are not perfect copies of a perfect original so to speak. Having said that, I have a nagging feeling that you are on to something here but I haven't been able to quite put my finger on it. Thanks for the responses to my comment, much appreciated. My aim is to fully understand Bernardo's Idealism so that I am in a position to explain it to someone else in my own words. So my question is asked as someone who is accepting and exploring the idea of Idealism and wanting to know exactly how that works. So I am not wanting to argue for dualism or materialism or panpsychism, I am exploring and enquiring within Idealism. My understanding of Bernardo's point of view is that consciousness creates images and forms in two distinct ways and he describes these as excitations. Secondary excitations are localisations of consciousness and are therefore conscious. An analogy given is of a whirlpool in water. Our brains and bodies and other life forms are images of that process of localisation. Primary excitations are what create non-conscious forms and images. Analogies given are ripples in water, vibrations of a guitar string and the spinning of a top. My question is, how exactly does consciousness create excitations that then appear to itself as forms and images, and in particular how does it create forms and images that are not localised consciousness, i.e. that are not conscious? What is the process that is at work here? Remember I am accepting that these excitations and images and forms are in consciousness and are not outside consciousness and I understand that there are two types, one conscious, one not conscious, and I follow the analogies, and I am not suggesting there is any logical inconsistency, but my question is how exactly does this process happen? I realise that dreams are a good example of this happening, but the fact that I can point to an example of it happening doesn't make it clear to me how it happens. In Why Materialism Is Baloney the analogy goes as follows: consciousness is the stream. Experiences are ripples or other excitations of the stream. Certain excitations, because of the patterns and regularities intrinsic to consciousness (i.e. the laws of nature, archetypes, etc. ), end up forming whirlpools, which are particular excitations that happen to entail localization. The moment this localization happens, a split occurs: next to the global conscious point-of-view that experiences all the ripples in the stream as its one dream, a localized point of view emerges as a split-off complex (or "alter") that experiences lucidly only the excitations within the boundaries of its vortex; a "disconnected" dream. But because this localized point-of-view also disturbs the broader consciousness stream, like a whirlpool disturbs the water flow in its surroundings, it also creates ripples and excitations that propagate to other whirlpools. This is how/why we can see and speak to each other: the disturbances around our whirlpools are the photons that bounce off of us, the air vibrations we create when we speak, etc. All this arises as a consequence of the natural unfolding of the patterns and regularities intrinsic to mind, i.e. the laws of physics and psychology, Maxwell's equations, E = mc2, gravity, Schrodinger equation, Jungian archetypes, psychic predispositions, Freud's libido, etc. etc. etc. Hi Stephen. Thank you for your question of the How. This reminds me of the Vedic story of a great warrior who had Brahman (God) as his human chariot driver. Just before a decisive battle the great warrior asked Brahman to show him his cosmic form so he could see the outcome of the impending war. But Brahman advised the warrior not to ask this because it was not meant for humans to see. The warrior insisted and Brahman left his human form and became his cosmic form. The warrior saw infinite universes pouring out of and into Brahman, the great loves and fears of all that ever existed or will ever exist, endless firery pain, cruelty, and suffering beyond comprehension. And he saw he would win the battle, but not until after the warrior had slaughtered many relatives fighting on the other side. Suddenly the great warrior fell to his knees and begged Brahman to return to his human form because he could not bear to see his cosmic form. And so Brahman returned to his human form. I have been a practicing physician for almost 30 years. I have treated thousands of patients with wounds from simple lacerations to complete amputations. I understand the pathophysiology, the microbiology, the histology, and the microscopic and gross anatomy of a healing wound. However, I also understand that there is an unseen intelligence in wound healing beyond my abilities that allows a wound to heal. Some "thing" that knows what to do and when to stop the process. I simply put everything back where is was, then the healing begins. Some thing beyond biochemistry tells each atom and molecule where to go, what to do, and when to stop. And this entire process of healing remains unconscious to me and the patient. But it is real, reproducible, and natural. How does this happen? We don't know. In the same way, I don't know how the One does what it does. But it is real, reproducible, and natural. Many Indian traditions describe this How process with images but to date there is no clear western explanation, let alone acceptance of a larger consciousness system in objective language. Maybe you can help us with this. I too would love to know How the LCS does what It does. However, I suspect even if I hear it, I wouldn't understand it. Like that great warrior, I'm really just a child. Hi John. Yes I think that how consciousness works is mysterious to most of us. But I suspect that that needn't always be the case. I think that at some point the workings of consciousness will be as mundane as any other process we are currently familiar with. The relevant point here with regards to the hard problem of consciousness is that I suspect a materialist who is being criticised for not kproviding the how of how matter creates consciousness would not be too impressed with an alternative theory that also doesn't explain how consciousness works, and simply states it is an unknowable mystery. I think Tom Campbell (My Bg TOE) does an excellent job of explaining the processes of consciousness in such a way that actually does make them seem quite mundane and not at all mysterious. "a materialist who is being criticised for not kproviding the how of how matter creates consciousness would not be too impressed with an alternative theory that also doesn't explain how consciousness works, and simply states it is an unknowable mystery"
Idealism simply holds that consciousness is fundamental and not composed of matter. This does not mean that consciousness is an unknowable mystery. The aspects of consciousness that are not innately knowable to us, such as the self localization mechanism that obfuscates the "unconscious" can still be explored through scientific means. If I understand the idealist position correctly, the relationship between the brain and consciousness could be likened to a "reducing valve". Rather than generate consciousness, the brain seems to behave like a modulator for consciousness. The brain is the image of these self localizing conscious processes and therefore the self localization mechanism that obfuscates the "unconscious" can be studied through neuroscience. As for the universe - the observable universe is simply the image of conscious processes. The universe is what consciousness does. The idealist should not need to provide the materialist with any extra explanation because the idealist view that the universe and the laws of physics are the result of conscious processes is no more complex than the idea that the universe and the laws of physics are the result of material processes. How the universe behaves in a conscious universe could be studied the exact same way a materialist would try to understand how the material universe works - through physics. The only difference is that the idealist would view physics as the study of patterns and regularities of obfuscated conscious processes instead of material processes. Idealism allows for the universe to potentially be knowable. Materialism on the other hand holds that everything that we perceieve is merely our brain's interpretation of a fundamentally unknowable reality. So it is materialism that truly views the universe as unknowable. I think the materialist who is "not too impressed" with the idealist view of consciousness should take a look at their own assumptions. The symmetry you suggest is not there. Every theory of worldview requires that we start from something irreducible, i.e. unexplainable. Under today's Standard Model, these are the fundamental subatomic particles. Under M-theory, these are the hyper-dimensional branes. These irreducible entities are called "ontological primitives," and they are ALWAYS necessary because we can only explain (i.e. reduce) one thing in terms of another thing, and that in terms of another things, and so, until we face the wall of the ontological primitives. After all, one can't explain one thing in terms of another forever. The quality of a worldview is in starting from as few ontological primitives as possible; as undeniable ontological primitives as possible; and then explain as much of reality as possible on the basis of the chosen ontological primitives. Here is where materialism is NOT symmetric with idealism (at least as I formulate it): materialism starts from abstract ontological entities that aren't undeniable (have you ever seen a hyper-dimensional brane?). Then, it fails to explain an obvious aspect of reality on the basis of the chosen primitives, namely, consciousness itself (the "hard problem"). Idealism, on the other hand, starts from consciousness itself, which is an undeniable ontological primitive. Then, it succeeds in explaining everything else on the basis of consciousness alone. Clearly, this is not a symmetrical situation. I must say, Bernardo, that it looks almost symmetric to me. I'm fine with taking consciousness to be primitive as an improvement on materialism for a theory, but I would argue, with Stephen by the sound of it, that to make it fundamental is to cause all the usual sorts of problems associated with materialism. If consciousness is a process then it depends on time. A true metaphysical; primitive would have to be prior to time. So I would favour idealism over materialism but would not see it as the end of the story. Both mind and matter would have to be reduced to reach the end. In consciousness studies this view would be 'relative phenomenalism' - as described by Edward Barkin somewhere. I'm not sure whether this fits with the idealism of Rational Spirituality but I do not see it as ruling it out, more like completing it. The whirlpool and the river analogies do their work, but they do not seem to be metaphysical primitives. I prefer the idea that the true primitive is 'beyond the coincidence of contradictories, and thus beyond the idealism/materialism or mind/matter dichotomy. The entire body of my work is an attempt to demonstrate that this is not so. This is a non sequitur. Under idealism, time is in consciousness, just like everything else. How do you define "mind" when you say this? I define mind = consciousness = the "space" of all subjective experience. I cannot see how mind, defined this way, isn't fundamental. There I use a dualist metaphor throughout. Have you read Why Materialism Is Baloney? Given this, I don't see why it's incoherent to state that the water is an ontological primitive. I cannot figure out what this might mean. Maybe the difference you are seeing is just in linguistic spooks, plays of words. Forget the "isms" that culture forces me to use: mind is simply what is, and that happens to be the space where subjective experience unfolds. PS: Intuitively, I sense what you might be trying to say. But for as long as we are communicating with words and, as such, bound to their limitations, we have no alternative but to try and be clear and rigorous with our use of words. This is my game. Better than that only ineffable, direct experience of transcendence, which is not a game of philosophy, but of enlightenment. Point 5. in neither argument provides a proof that that is how the secondary phenomena occurs, only a theory. So is the difference between the two theories as follows: that materialists require proof for their theory to be acceptable, as that is the standard they set for themselves, but idealists don't, as for them metaphor and analogy are sufficient? Idealists would argue that proof will never come for the materialists because their ontological primitive of matter is the wrong assumption, and materialists would argue that proof will never come for the idealists because their ontological primitive of mind is not susceptible to proof. Does either argument have a claim to being more logical, more rational, more consistent? Bernardo: "materialism starts from abstract ontological entities that aren't undeniable (have you ever seen a hyper-dimensional brane?). Then, it fails to explain an obvious aspect of reality on the basis of the chosen primitives, namely, consciousness itself (the "hard problem"). Idealism, on the other hand, starts from consciousness itself, which is an undeniable ontological primitive. Then, it succeeds in explaining everything else on the basis of consciousness alone. Clearly, this is not a symmetrical situation." I think a materialist might make a similar point from their point of view, that is that they are starting from an assumption that is to them undeniable, namely, there is objective stuff out there that we all experience and it can be measured and tested and verified; whereas the idealist, they might argue, starts off with consciousness which is relative, subjective and nebulous. They may even be so cheeky as to ask, 'have you ever seen consciousness?' And when the idealist replies, we experience it every moment as we are localised areas of consciousness, the materialist may retort with, 'we experience the hyper dimensional brane every moment through our brains'. Peter: "I prefer the idea that the true primitive is 'beyond the coincidence of contradictories, and thus beyond the idealism/materialism or mind/matter dichotomy'"
I like this idea too; how about this as a possibility of a synthesis of the thesis/antithesis of materialism/idealism: information. Information is neither matter nor consciousness. Both matter and consciousness can store and communicate information. Information can generate all the experiences of matter: for example, virtual realities. This is not matter as a materialist would think of matter, but it would be an exact simulation. Can information generate all the experiences of consciousness? A consciousness that is not how an idealist would think of consciousness, but nevertheless an exact simulation? Perhaps neither matter nor consciousness are fundamental, nor real. Perhaps they are both simulations generated by information. This may not seem possible to us now but neither would the idea of virtual realities not that long ago. Maybe the arrival of artificial intelligence in the future will begin a serious discussion of information as the true ontological primitive. The ontological primitive of idealism is the primary datum of reality: conscious experience. In fact, it is the only carrier of reality anyone can ever know. Under idealism, matter -- its concreteness, palpability, solidity, continuity, etc. -- is an experience. The ontological primitive of materialism is an abstraction: matter outside mind lacks all qualities of experience and is akin to mathematical equations. By definition, matter outside mind is unknowable (knowledge resides solely in mind). It is merely an inference. Clearly, the ontological primitive of idealism is not symmetrical to that of materialism. Now, idealism can explain ALL empirical reality on the basis of consciousness/mind as ontological primitive. If can explain how everything arises as processes in mind. Materialism, on the other hand, cannot explain consciousness itself, the primary datum of existence. It cannot explain how the most undeniable and present aspect of reality can emerge from matter. This is the "hard problem of consciousness." So, again, there is no symmetry between materialism and idealism. One can always frame an argument in a way that there appears to be a symmetry of form. But let's not get lost in abstractions and linguistic ghosts. Materialism cannot explain your subjective experience of being you right now. Idealism postulates LESS than materialism (it does not postulate a whole darned universe outside experience) and explains MORE. No, there is no symmetry. Just read his again, Stephen, while remaining honest to yourself. The human ability to get utterly lost in abstraction and linguistic games never ceases to amaze me! This is not directed only at you, Stephen, but most of our culture. Consciousness is everything you've ever know, will know, can know. Try to see past the linguistic games. This stuff is nonsense. Come back to the primary data, to your immediate experience. What is information? What is a world that lacks all qualities of experience? Try to see past all the abstraction nonsense culture has forced on you. Reality is incredibly simple and is right in front of your eyes. If artificial intelligence became a reality how would an Idealist describe that? A primary excitation that becomes a secondary excitation? Is that possible? I can't see any reason why a localisation of consciousness has to have an image that is biological and not technological. "The ontological primitive of materialism is an abstraction: matter outside mind lacks all qualities of experience and is akin to mathematical equations. By definition, matter outside mind is unknowable (knowledge resides solely in mind). It is merely an inference." "Come back to the primary data, to your immediate experience." My immediate experience is of separate conscious beings interacting with each other in a shared environment of non-conscious things. I have no immediate experience of one consciousness, no immediate experience of being a localised area of one consciousness, and no immediate experience of non-conscious things beings ripples in one consciousness. The idea of one consciousness is, to me, an abstraction. It is an idea, I have no primary data to refer to. And if the mystics and spiritual teachers are to be believed, then to truly experience one consciousness I would have to end completely my experience of being a localised consciousness, as Krishamurti put it, I would have to die alive; one consciousness is unknowable whilst existing as a localised consciousness. The creation of a localised area of consciousness necessitates the obfuscation of the one consciousness, so how can that be in my primary data of immediate experience? The only thing I can say from my direct immediate experience is that my consciousness exists and non-conscious things exist and other consciousnesses like myself seem to exist. As to the true nature of unconscious things and whether all the consciousnesses that I am aware of are somehow all part of one consciousness, that is a matter of science, speculation, philosophy and transcendental experience. Eric: "As for the universe - the observable universe is simply the image of conscious processes. The universe is what consciousness does. The idealist should not need to provide the materialist with any extra explanation because the idealist view that the universe and the laws of physics are the result of conscious processes is no more complex than the idea that the universe and the laws of physics are the result of material processes. Idealism allows for the universe to potentially be knowable. Materialism on the other hand holds that everything that we perceieve is merely our brain's interpretation of a fundamentally unknowable reality. So it is materialism that truly views the universe as unknowable. I think the materialist who is "not too impressed" with the idealist view of consciousness should take a look at their own assumptions." If the idealist sees the universe as working by the same laws of physics as the materialist, do they then not also see the universe as being generated by those laws of physics? Quantum physics is the current best descriptor of how the universe works, I believe, but aren't these laws of quantum physics as much about how matter manifests, not just how it behaves after it is here? Is then the idealist position simply that these laws of quantum generation of matter are in consciousness, rather than being outside of consciousness? If so what makes the materialist laws of physics unknowable? They are equally known by materialists and idealists. Is it then the source of the laws of physics that is unknowable for the materialist? Do materialists think the laws of physics have a source? Do they need a source? Can they not just be, just exist? Is adding a source, i.e. one consciousness, an unnecessary additional assumption? If the source is the one consciousness, is this knowable to a localised part of consciousness? The consciousness that I know, my own, I am pretty sure, isn't the source of quantum physics. If idealism accepts the universe works according to the laws of physics then doesn't the idealist have to accept that the way we perceive the universe is through our senses and therefore through our brain? The idealist may then say that the brain is in consciousness, but that process of the brain generating the images that we see is still happening isn't it, even when it is happening within consciousness? So what is being said when it is said that a materialist is postulating an unknowable universe because the source of the interpretations of the brain are beyond our senses? If the source of our perceptions is consciousness then this too is equally beyond our senses. The laws of physics are knowable and generate matter and matter is knowable through our senses. Why does the non-consciousness of the laws do physics make them unknowable? The idealist does not say that primary excitations that are non-conscious are unknowable. They are knowable as we experience them within our consciousness as forms through our perceptions. Is this not the same for the laws of physics, we know them through the understanding of our intellect and experience them through forms through our perceptions? Bernardo - Again my reply to your comment seems to have disappeared. I just wanted to say, please don't imagine I'm arguing against your view. I'm just niggling about its metaphysical completeness, a subtle issue that can wait and which is not important for most purposes. Oh hell. It didn't disappear, I missed it. Like you, Stephen, I have only recently learned of Bernardo's ideas and I am sure that Bernardo can respond in better words than I can. Since you responded to me by name though, I'll reply to the best of my ability. >>If the idealist sees the universe as working by the same laws of physics as the materialist, do they then not also see the universe as being generated by those laws of physics? No, the laws of physics are in consciousness along with everything else. >>Quantum physics is the current best descriptor of how the universe works, I believe, but aren't these laws of quantum physics as much about how matter manifests, not just how it behaves after it is here? Quantum fluctuations would simply be the result of conscious processes. >>If so what makes the materialist laws of physics unknowable? The materialist holds that our consciousness is the result of brain activity. Under this view, what we experience is not reality - it is our brain's interpretation of reality. This leads to the inescapable conclusion that reality is fundamentally unknowable. >>Do materialists think the laws of physics have a source? Do they need a source? Can they not just be, just exist? Is adding a source, i.e. one consciousness, an unnecessary additional assumption? The idealist holds that only consciousness is necessary to explain reality. What we see as matter and the laws of physics are not separate from consciousness, so no additional assumption is being made. The universe is what consciousness does. Materialism fails to explain consciousness. Materialism has to account for the existence of consciousness and something separate from consciousness (unconscious matter). Materialism also postulates an entire universe that can never be known. If anything, materialism makes more assumptions than idealism. >>If the source is the one consciousness, is this knowable to a localised part of consciousness? The consciousness that I know, my own, I am pretty sure, isn't the source of quantum physics. I think so. If the brain is the image of localizing processes of consciousness, then the death of the brain would result in delocalization and an expansion of conscious awareness. I believe that near death experiences are an example of people experiencing the greater consciousness. I believe that meditation, sensory deprivation, and drugs can also result in varying degrees of delocalization. >>If idealism accepts the universe works according to the laws of physics then doesn't the idealist have to accept that the way we perceive the universe is through our senses and therefore through our brain? The idealist may then say that the brain is in consciousness, but that process of the brain generating the images that we see is still happening isn't it, even when it is happening within consciousness? If you view the brain as the image of a self-localization process, then yes, by its very nature it is going to have an effect on our conscious experience. It would be absurd to deny any of the correlations that neuroscience has found between mind and brain. Idealism does not conflict with any scientific findings. >>So what is being said when it is said that a materialist is postulating an unknowable universe because the source of the interpretations of the brain are beyond our senses? If the source of our perceptions is consciousness then this too is equally beyond our senses. Materialism requires that the universe is fundamentally unknowable. Idealism does not. Through altered states of consciousness it could be possible to directly experience things that seem mind blowing to our normal localized consciousness. Many near death experiencers claim to have done just that. >>If artificial intelligence became a reality how would an Idealist describe that? As stated above, the brain is the image of a self-localizing process. If we were able to reproduce this self-localization process through artificial means, then I see no reason why the artificial process would differ from the natural process in its effect on consciousness. Idealism does not conflict with artificial intelligence. An idealist would not view artificial intelligence as the 'creation' of consciousness as a materialist would. Instead, the idealist would view artificial intelligence as a man-made self-localization process. The point is that the source of quantum physics is "your" consciousness because "your" consciousness is all consciousness. There is no individualized consciousness staring out of your eyeballs. The same consciousness is staring out of every set of eyeballs. Individuality is the illusion. Otherwise something special would have to be creating an individualized consciousness in each case. What would that special thing be? All you have to do is accept the fact that you are the One consciousness. It's that simple. If you can't and must insist on continuing to question don't worry because you'll get it when you die. "The point is that the source of quantum physics is "your" consciousness because "your" consciousness is all consciousness. There is no individualized consciousness staring out of your eyeballs. The same consciousness is staring out of every set of eyeballs. Individuality is the illusion." I wouldn't describe a ripple or a whirlpool - a primary or secondary excitation in consciousness - as an illusion, but as an actual process and a real phenomena. When I refer to my consciousness I am referring to the description under idealism of a localised space of consciousness from which the one consciousness has been obfuscated. "Otherwise something special would have to be creating an individualized consciousness in each case. What would that special thing be?" Why would that have to be the case? Why would they have to be created? Is something special creating the one consciousness? If something could create one consciousness why couldn't it create many? If one consciousness doesn't need a creator why should many? Alternative answer: the special thing is a secondary excitation in consciousness causing a localised area of consciousness. "All you have to do is accept the fact that you are the One consciousness. It's that simple. If you can't and must insist on continuing to question don't worry because you'll get it when you die." I'm really not sure about the merits of simply accepting anything. Questioning with open-minded scepticism is a healthy and rewarding past-time. I see no merit in being a believer. Also I think you are assuming that I am arguing against the idealist position and that I don't believe it or think that it is wrong. That is not the case, I am simply exploring for the benefit of my own understanding and entertainment. I really don't think leaving this body qualifies you for any sudden, fundamental and lasting change of your consciousness such that you lose all sense of separate identity and are absorbed back into the one consciousness. I think there is a bit more time and effort required in gradually widening our awareness and raising our consciousness. As the saying goes, 'just because your dead, doesn't mean you're enlightened'. Thanks again for your comments, I feel quite privileged to be able to post here and to be able to engage constructively with some very intelligent and experienced people. It is a very edifying and clarifying experience. I'm really not sure about the merits of simply accepting anything. Questioning with open-minded scepticism is a healthy and rewarding past-time. I see no merit in being a believer. This is well and good as long as you're in the mode of some type of academic inquiry. My whole search for understanding came from an extreme fear of death that occurred out of the blue. When you're in that mode things are far from academic. One needs to know what's going on just to continue in this world. So the One Mind or Consciousness came as realization out of despair. Then searching revealed that this was indeed the case. I never was the individual I thought I was so death cannot be the end of everything. It's actually so obvious now it's like like 2+2=4. Like one NDEr said "There is peace in knowing". That is the merit, especially when you're viscerally aware that the bullet with your name on it is already in the air. >Perhaps neither matter nor consciousness are fundamental, nor real. Perhaps they are both simulations generated by information. This idea that information can be ontologically more basic than consciousness really pushes my buttons. :) Picture my face turning beet red, teeth gritted and steam coming out of my ears. How in hell can this possibly be? How can there be information without consciousness to create the quale of it being information in the first place? Grammatically correct natural language sentences and $2 will buy you a cup of coffee. >The only thing I can say from my direct immediate experience is that my consciousness exists and non-conscious things exist and other consciousnesses like myself seem to exist. I would suggest to you that this is an interpretation of your experience based on an deep western materialist worldview bias that we grow up with. Your direct, immediate experience also includes you dream experiences which clearly contradict this. Many people seem to have an intuitive, deep experience of God, and/or a connectedness to the universe, which is certainly a form of one consciousness, even if historically not interpreted as the one consciousness described in Bernardo's in K. Idealism. > No immediate experience of being a localized area of one consciousness, and no immediate experience of non-conscious things beings ripples in one consciousness. Do you have an immediate experience of being made of molecules, elemental atoms et cetera, on down? >As to the true nature of unconscious things and whether all the consciousnesses that I am aware of are somehow all part of one consciousness, that is a matter of science, speculation, philosophy and transcendental experience. RHC: "This idea that information can be ontologically more basic than consciousness really pushes my buttons. :) Picture my face turning beet red, teeth gritted and steam coming out of my ears." "I would suggest to you that this is an interpretation of your experience based on an deep western materialist worldview bias that we grow up with. Your direct, immediate experience also includes you dream experiences which clearly contradict this. " I don't think my description is in any way materialist and certainly it wasn't intended to be at all. Read it again from the point of view of someone who has never purported to be a materialist and who wants to describe their experience of what the idealist would refer to as primary and secondary excitations, but without using those particular terms and maybe you will get a different sense from it. "Do you have an immediate experience of being made of molecules, elemental atoms et cetera, on down? " As the saying goes, 'a blunt knife is best sharpened by trying to cut against an already sharpened one'. What really upsets me about materialist science is all the progress we could be making if institutional science would spend just 1% of the billions it spends every year on some non material science like the following. We could be so much further down the road of science and maybe a better world. Just because one thing looks and acts like another thing does that mean they share similar properties? DNA "looks" an awfully lot like twisted electrical Birkland currents. It also "swims" in plasma like Birkland currents but what exactly is a Birkland current? 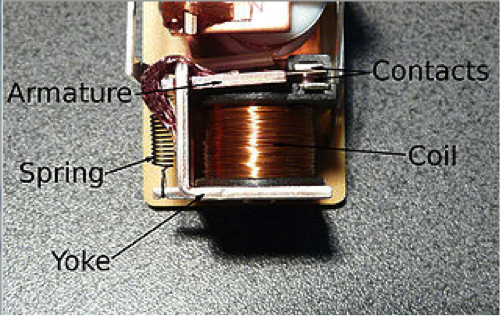 A Birkland current usually refers to the electric currents in a planet's ionosphere that follows magnetic field lines. They are caused by the movement of a plasma perpendicular to a magnetic field. Birkland currents often show filamentary or twisted "rope-like" magnetic structure. Recent scientific research by Nobel Prize winner Biologist Dr Luc Montagnier also got a "quack" out of DNA by demonstrating electromagnetic waves from bacteria DNA. But here's the amazing part. When Dr Montagnier put the DNA in a test tube next to another test tube with water and no DNA, when both tubes were wrapped with electrical wire with a low voltage, the same DNA later appeared in the second test tube. If this is true what does it mean? Before his research scientists only believed life could come from life. But his research suggests life may be able to be created, or at least transferred via electromagnetism. What does this have to do with Birkland currents? Let's see, both are twisted, exist in plasma, and create electromagnetic waves. Sounds like a duck to me. If this is true it opens up an entirely new area of research for DNA, disease, and hopefully treatment and cures of human illness. Can you say "Quack?" DNA can. Maybe my Neutral monist view ( as seen in http://www.sciencechatforum.com/viewtopic.php?f=51&t=27823&start=0 ) can contribute to this discussion.